We cruised recently on the Queen Mary 2 from Dubai to Hong Kong Queen Mary 2 is a transatlantic ocean liner. She is the largest ocean liner ever built, having served as the flagship of the Cunard Line since succeeding the Queen Elizabeth 2 in 2004. As of 2019, Queen Mary 2 is the only passenger ship operating as an ocean liner. A key point is that the Queen Mary as a liner travels the trans-Atlantic route for the majority of the year, Southampton to New York, but also does an annual World voyage as a cruise ship. Our cruise was part of that annual voyage from Southampton to Japan and back. The public areas are very opulent and there are many inside options for activities and eating areas. However, being a liner there are not many outside eating areas, and the poolside seating is limited and in the evening non-existent. As we travelled through tropical countries it would have been good to be able to savour the balmy evenings on sea days and after leaving port. We particularly enjoyed the Planetarium sessions and the guest lecture series. Craft sessions, Zumba, chair aerobics and line dancing were also available on the frequent sea days. We were in a cabin on deck 5 and found the décor and fittings tired; with the carpet needing a good clean and the cracked tiles in the bathroom replaced. It is obvious that the British class system is very alive and well on QM2. There were several deck areas and restaurants on the ship that were out of bounds for the majority of the passengers. Areas that didn’t seem to have much patronage despite covering significant areas of the ship. The entertainment changes frequently with speakers, comedians and other entertainers either joining or leaving the ship at many ports. The entertainment from Dubai to Singapore was excellent, but from then on it was mediocre for some reason. The size and draught of the QM2 meant that may times we couldn’t dock at the cruise ship terminal and ended up at a working port. These ports were often a distance from the nearest town. For instance Doha, we docked about a 50 minute drive from the town, similarly in Chan May which was about 45 minutes from the town. Because these were working ports, we needed to shuttle to the port gate to meet our tour, designated taxis were sometimes allowed on the port but charged to get to the gate. Several of these ports seemed to be maiden visits and much was made of the ceremonies that took place. But as a passenger, it used up valuable shore time travelling to the nearest point of interest and they were unattractive, messy places. The major disappointment with Cunard and QM2 is that they will not tender wheelchair passengers. 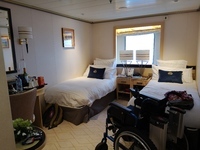 We have tendered safely many times with other cruise lines, but with Cunard wheelchair passengers have to step over a 45cm gap unassisted to be able to tender. I observed a lift to the tender platform and there are wheelchair accessible ramps into the tender, and a space where wheelchairs could be parked. But wheelchair passengers are discriminated against and denied going ashore at tender ports. My observations were that many of the elderly walking passengers were more unsteady on their feet and more likely to fall while transferring. Whereas, a wheelchair passenger is safe in their wheelchair and can be easily wheeled onto the tender. Subsequently we will never travel with Cunard again. There were no shore excursions that could be undertaken with a wheelchair. The only offering was a vehicle at a huge cost in several of the ports where we could follow a tour and maybe gain access to the attraction. Therefore, we organised our own shore excursions but trying to get times of arrival and departure at all the ports proved to be a mission. I achieved it finally only by contacting Cunard via their Facebook page. But finding out which part of the port, which berth or gate proved impossible. Thankfully the tour guides we employed were able to use their initiative and local knowledge to find us. But in many cases they were not allowed onto the ports. So where we had organised a wheelchair accessible taxi we had to carry my husband into a taxi to get to the port gate and then lift him out of the taxi. Not a pleasant experience for everyone, in high temperatures and humidity. Finally in Singapore, one wheelchair accessible taxi was provided in the rotation to transport wheelchair passengers to the Marina district. On the way back to the ship we were thankfully provided with a wheelchair accessible bus and loaded in three wheelchairs for the trip back to the ship. In summary I think QM2 should stick to trans-Atlantic crossings and leave cruises to designated cruise ships that are designed for cruising. If you are in a wheelchair definitely don’t cruise with Cunard. If you are in a wheelchair definitely don’t cruise with Cunard. 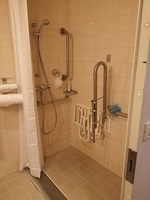 The shower are with the obstructing bar. We created a turning circle by splitting the king bed into singles. Queen Mary 2 is a transatlantic ocean liner. She is the largest ocean liner ever built, having served as the flagship of the Cunard Line since succeeding the Queen Elizabeth 2 in 2004. As of 2019, Queen Mary 2 is the only passenger ship operating as an ocean liner. A key point is that the Queen Mary as a liner travels the trans-Atlantic route for the majority of the year, Southampton to New York, but also does an annual World voyage as a cruise ship. Our cruise was part of that annual voyage from Southampton to Japan and back. The public areas are very opulent and there are many inside options for activities and eating areas. However, being a liner there are not many outside eating areas, and the poolside seating is limited and in the evening non-existent. As we travelled through tropical countries it would have been good to be able to savour the balmy evenings on sea days and after leaving port. We particularly enjoyed the Planetarium sessions and the guest lecture series. Craft sessions, Zumba, chair aerobics and line dancing were also available on the frequent sea days. We were in a cabin on deck 5 and found the décor and fittings tired; with the carpet needing a good clean and the cracked tiles in the bathroom replaced. It is obvious that the British class system is very alive and well on QM2. There were several deck areas and restaurants on the ship that were out of bounds for the majority of the passengers. Areas that didn’t seem to have much patronage despite covering significant areas of the ship. The entertainment changes frequently with speakers, comedians and other entertainers either joining or leaving the ship at many ports. The entertainment from Dubai to Singapore was excellent, but from then on it was mediocre for some reason. The size and draught of the QM2 meant that may times we couldn’t dock at the cruise ship terminal and ended up at a working port. These ports were often a distance from the nearest town. For instance Doha, we docked about a 50 minute drive from the town, similarly in Chan May which was about 45 minutes from the town. Because these were working ports, we needed to shuttle to the port gate to meet our tour, designated taxis were sometimes allowed on the port but charged to get to the gate. Several of these ports seemed to be maiden visits and much was made of the ceremonies that took place. But as a passenger, it used up valuable shore time travelling to the nearest point of interest and they were unattractive, messy places. The major disappointment with Cunard and QM2 is that they will not tender wheelchair passengers. We have tendered safely many times with other cruise lines, but with Cunard wheelchair passengers have to step over a 45cm gap unassisted to be able to tender. I observed a lift to the tender platform and there are wheelchair accessible ramps into the tender, and a space where wheelchairs could be parked. But wheelchair passengers are discriminated against and denied going ashore at tender ports. My observations were that many of the elderly walking passengers were more unsteady on their feet and more likely to fall while transferring. Whereas, a wheelchair passenger is safe in their wheelchair and can be easily wheeled onto the tender. Subsequently we will never travel with Cunard again. There were no shore excursions that could be undertaken with a wheelchair. The only offering was a vehicle at a huge cost in several of the ports where we could follow a tour and maybe gain access to the attraction. Therefore, we organised our own shore excursions but trying to get times of arrival and departure at all the ports proved to be a mission. I achieved it finally only by contacting Cunard via their Facebook page. But finding out which part of the port, which berth or gate proved impossible. Thankfully the tour guides we employed were able to use their initiative and local knowledge to find us. But in many cases they were not allowed onto the ports. So where we had organised a wheelchair accessible taxi we had to carry my husband into a taxi to get to the port gate and then lift him out of the taxi. Not a pleasant experience for everyone, in high temperatures and humidity. Finally in Singapore, one wheelchair accessible taxi was provided in the rotation to transport wheelchair passengers to the Marina district. On the way back to the ship we were thankfully provided with a wheelchair accessible bus and loaded in three wheelchairs for the trip back to the ship. In summary I think QM2 should stick to trans-Atlantic crossings and leave cruises to designated cruise ships that are designed for cruising. If you are in a wheelchair definitely don’t cruise with Cunard. We were in an accessible cabin, the space was very limited with no turning circle until we got the cabin steward to split the bed into two singles and take away a chair. The bathroom was workable and a toilet raiser was provided as requested. The shower had a seat but it also had a bar that could be lowered in the center of the shower area, making transferring difficult. This bar was broken and wouldn&apos;t stay retracted until I tied it with string. Thankfully we had our own commode chair so with a bit of maneuvering we got the shower area to work. The carpets were grubby and the bathroom tiles were cracked. We used Tours by Locals again and drove to Galle where our guide met us. We walked around the fort and learned some of the history of the area. We then visited a home in the hills where the owner cooked us a delicious meal, 4 vegetarian curries, washed down with the local beer. We visited the Marble mountain, Da Nang beach, Marble stone village and walked and explored Hoi An ancient town. Having a personal guide enable us to ask questions and learn about the local people and customs. We went to a local restaurant for an authentic meal. We spent three days here before embarking. A exciting city, the metro is wheelchair accessible and a cheap and easy way to get around. Loved the Marina district. We disembarked here and explored independently Kowloon, and Hong Kong Island. A highlight was the Museum of Hong Kong and taking a local bus to Stanley. We hired accessible taxi and explore the churches of Old Goa and Panjim. A little limited an many places were not wheelchair accessible. The guide and driver did very well to give us a flavour of the area. beautiful local meal a highlight. Up into the Green Mountains, magnificent scenery and our guide shared lots of local history and stories. Amazing geology. Lunch at a local restaurant, ate camel! Very good. Gillian our guide was very informative, on a walking tour if Georgetown we visited a wet market, the Clan Jetties and Khoo Kongsi, a Chinese Clan House, and Baba Nyonya Museum. It gave us a wonderful taste of the history and culture of the town. I joined an excursion from the ship, we visited several interesting historic buildings and museums. Unfortunately, we were also taken to places where we were pressured to buy overpriced goods. We explored the Marina District independently; the Singapore flyer, Marina Sands Hotel, Gardens by the Bay and the walkways around Marina Bay. More than enough to savour over 1 1/2 days. The Gardens By The Bay are definitely worth a visit, you can spend a day exploring here.